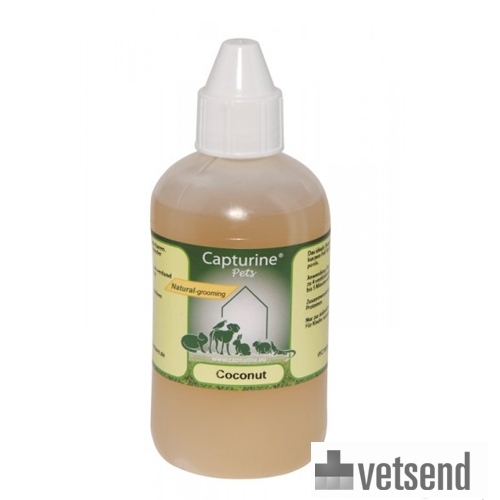 Capturine Natural Grooming - Coconut Shampoo is the ideal shampoo for rough-haired and short-haired dog breeds. The shampoo makes a dog's coat extremely smooth, glossy and less porous. Wet your dog's coat thoroughly with a diluted 1:4 shampoo/water mixture. Massage the shampoo in well, and leave for 3 to 5 minutes. Then, rinse your dog's fur thoroughly. Have you used Capturine Natural Grooming - Coconut Shampoo before? Let us know what you think about this product.